- CPU MTK6580 quad core 1.3GHZ, ROM 4GB + RAM 512MB. - Aluminum watchcase with anodic oxidation processing,CNC manufacturing. - 1.39 inch UHD AMOLED whole round screen, resolution 400*400 pixel,OGS capacitive screen. - Built-in Android 5.1 OS, easy online upgrade operating system. - 3G supported, Nano SIM 3G WCDMA 850/2100 or customized,2G GSM 850/900/1800/1900 quad-bands. - Support pedometer, heart rating, anti-theft etc. - Support both iOS and Andriod phone connecting. 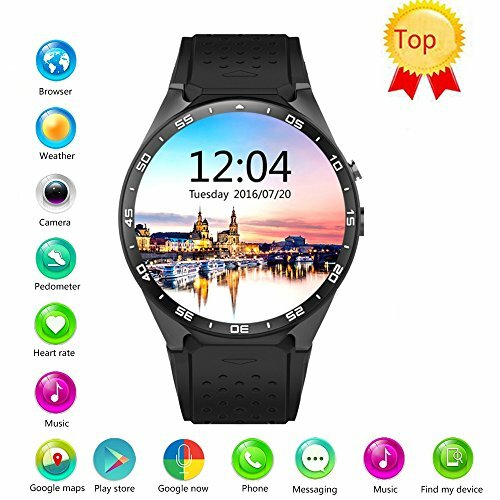 Phone call,SMS,Caller ID display,WIFI,GPS,Heart Rate,OS online upgrade,Info bluetooth sync,Screen on gesture,Google map,Google play,Voice assistant,Weather,Brower,Anti-lost,remote control etc. 【Powerful battery】400mAH Polymer lithium battery. Charging for 4-5hours, and it can standby for 3-5 days. Working time is 2-3 days. 【Advanced Configuration】Android 5.1 system, MTK6580 CPU, 3GHZ Quad Core Processor, RAM 512M+ROM 4GB, 2.0MP camera, 400 x 400 Pixels Resolution Capacitance TP VUO AMOLED Screen. Multiple dial interface can be selected for different situation. Also you can download from the Internet. 【Wifi & APP Download】Built on Android 5.1 OS with thousands of apps and voice assistant at the Google Play Store. Download the APP, the watch can be connected to the phone via Bluetooth to sync data. 【Multi-Function】Multi Function: Support Speaker, Microphone, Camera(2.0MP 720P), G-sensor, GPS, WIFI, 3G Network, NANO SIM card(NOT included), Pedometer, Calories Calculation, Sedentary remind, Sleep monitoring, Remote photos, Alarm clock, notification push including facebook,twitter, email,calls,texts,etc. For ANDROID,all functions can be used. For IPHONE,the smartwatch supports Partial Functions.